Hello and Welcome to Designs by Debi™! My collection is extensive and includes pieces designed with CRYSTALLIZED™ - Swarovski Elements, pearls, shells, artisan lampwork glass beads, semi-precious gemstones and more. Many of my designs are one-of-a-kind so you have opportunities to own custom handcrafted jewelry that no one else will ever have! I also offer designs you can personalize. My Personalized Keepsake Bracelets incorporate names and birthstones to create gorgeous bracelets for Mothers, Grandmothers, Sisters, Friends or anyone with a desire for expression. My Support Your Soldier Bracelets™ are a wonderful, comforting show of support for those of you with loved ones in the military. I created the Rainbow Bridge Pet Memorial Bracelets™ especially for those who have lost beloved pets. I have a collection of Awareness Jewelry in the colors of many worthy causes. And I just introduced Remember 9/11 Memorial Bracelets™ in personalized and non-personalized designs as a heartfelt tribute to those who lost their lives in the attacks on September 11th and the families they left behind. key chains, handbag charms, bookmarks, rosaries and prayer chains. Not seeing exactly what you want, send me an e-mail...we can collaborate on something especially for you. Have an outfit that youd like jewelry designed to match...we can do that! Special occasion coming that you want to turn heads at...we can make it happen! One of the amazing things about handmade jewelry is that the possibilities are endless! I want to be your favorite source for beautiful jewelry and useful jewelry information and tips. Come on in and see what's new! I hope you enjoy your visit. Thank you for spending your time with me! .yes, I am building it myself :) so check back often to see what new treasures you will find! The Designs by Debi Handmade Jewelry Reference Center is information heaven for artisan handmade jewelry enthusiasts and includes lots of handy reference material for everyone. 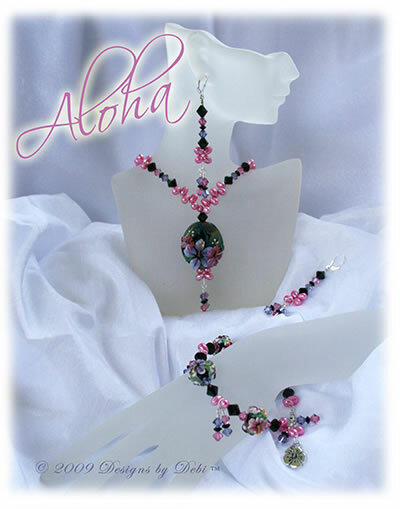 With designs inspired by the beautiful islands of Hawaii and the spirit of aloha, the Aloha Collection Boutique is the best place for you to find tropical floral, shell, mother of pearl and beach-themed jewelry. Designs by Debi offers various types of Memorial Bracelets to bring you comfort after the loss of a loved one. 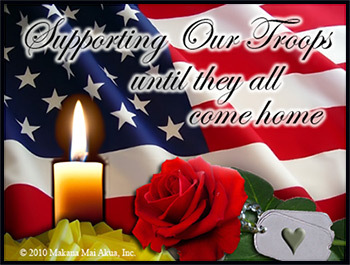 These include Personalized Keepsake Bracelets In Memory of a Loved One, 'In Memory' Support Your Soldier Bracelets™, Remember 9/11 Memorial Bracelets™, 'In Memory' Awareness Bracelets and Rainbow Bridge Pet Memorial Bracelets™. So if you're looking for a piece of Memorial Jewelry this is a great place to start. Personalized Keepsake Bracelets make wonderful gifts for mothers, grandmothers, daughters, aunts, godmothers, sisters, friends, girlfriends, brides, bridesmaids and pet moms, too! I greatly expanded my line of Keepsake Bracelets in November 2010. There are now 5 designs ~ Name/Birthstone, Pet Name, Couples, Family and Generations ~ AND they come in 12 styles and 90 possible bead combinations!! The Remember 9/11 Memorial Bracelets™ were designed as a heartfelt tribute to those who lost their lives in the attacks on September 11th and the families they left behind. The come in personalized and non-personalized designs. Here you will find beautiful sterling silver awareness bracelets designed in the color of any cause dear to your heart. Survivor and In Memory bracelets are also available. These instructions will guide you step-by-step through the ordering process for special order bracelets. Use this Bracelet Sizing Guide to be sure you order the correct size bracelet. The Guardian Angel Prayer Chain is a concept that I created back in 2007 and it is unique to Designs by Debi. It's meant to serve as a meaningful representation of intentions that can be held during prayer to bring comfort to the holder. The Designs by Debi Handmade Jewelry Bookmarks Boutique is full of really great bookmarks in three styles...shepherd's hook, thong and ribbon slide. Are you a reader? Do you have a reader on your gift list? Come check it out! Learn more about Debi, the Designer and President of Designs by Debi Handmade Jewelry. Here are events where you can find Designs by Debi handmade jewelry. Do you know the easiest way to find the best Holiday gifts? Host a Designs by Debi holiday trunk show and let the perfect gifts come to you! Need a special gift, but having trouble deciding exactly what to get? Give a Designs by Debi gift certificate. Your jewelry-loving family and friends will thank you! Designs by Debi is excited to offer you the option of a Layaway Plan! We are dealing with some very difficult economic times. But Birthdays, Christmas and other gift-giving occasions still come. This layaway plan can help ease the burden. Designs by Debi is pleased to offer a referral program. It is my way of thanking you for spreading the word about my work and gives you a chance to earn free jewelry! What are RSS and Blogs? Here you'll find out about RSS, how to use it and all the ways you can keep up with Designs by Debi online. Read about these beautiful little works of art used so often in Designs by Debi Handmade Jewelry. And take the opportunity to read pages submitted by the glass artists behind these beads and comment on them. It's ALL About the Bangles! !